What an interesting career was had by our July speaker, Sue Smart. She spent all 43 years of her working life in Harrods, from the age of seventeen as a Junior until she finally retired after being a Buyer in various departments. Harrods began as a small store in Stepney, East London, in a single room owned by Charles Henry Harrod selling only tea and groceries. The store moved to Knightsbridge and expanded in 1849, until gradually the business occupied the whole block in the Brompton Road. After the Great Exhibition at Crystal Palace in 1851, Knightsbridge became a very fashionable area and the store enjoyed great success. In 1898 an escalator was installed – England’s first – and smelling salts or a stiff drink were offered to its daring early passengers after their trip! In the same year Harrods issued its first Catalogue, where all its products were listed. The Harrods motto is Omnia Omnibus Ubique, which is Latin for “all things for all people, everywhere”, so you can imagine the size of this publication! As far as Sue Smart is concerned – she began her career there travelling from her home in Neasden as a Junior trainee in 1968. Her training took two years including one day a week at college and during that time she worked in several different departments. When decimal coinage was introduced in 1971 she was one of the “Decimal Pennies” who were stationed on each floor of the shop each wearing a sash to make them visible to the customers and offering help with the new currency. During the ’60s and ’70s she remembers the I.R.A. bomb threats and the store had to be evacuated a number of times. In 1974 a bomb did actually go off in the House & Garden Tools department which was sealed off in time to minimise damage and no one was hurt. The January Sales attracted large numbers of customers, some of whom camped outside to be first to get the bargains and takings often exceeded £100 million in this month! One of Sue’s unusual roles as a Buyer was in the Pets Department, and one of her first trips abroad as a Buyer was with the merchandise director to Frankfurt to a Pets Accessories Trade Fair. After a day of walking around the stalls she was told that the next day she could buy whatever fancy accessories caught her eye – and the more unusual the better! As a Buyer for the Linens department Sue visited China, India and the USA in search of beautiful hand-made products, and one banqueting-size tablecloth covered in hand-made lace which she brought back actually sold for £40 000! Famous customers who Sue remembers include Priscilla Presley (who regularly visited the linen department), plus countless celebrities, an Arab princess and several members of the Royal family. Sue told us that Al Fayed was a very generous and hands-on employer who was often in the store and who knew many of his staff by name. After the death of his son Dodi he eventually decided to sell it in 2010 to Qatar Holdings for £1.5 billion. It was – as Sue says – the end of an era, and soon after this she retired, taking all her remarkable memories with her. We all enjoyed her sharing some of them with us! Harrods began as a small store in Stepney, east London, in a single room, run by Charles Henry Harrod, selling tea and groceries. At first he employed 2 assistants and a grocery delivery boy. The store moved to Knightsbridge and expanded in 1849. After the Crystal Palace exhibition Knightsbridge became very fashionable and the store became very popular. It was damaged by fire in the 1880s and had to be rebuilt. Gradually it expanded to include the whole block in the Brompton Road. During the 1960s the number of staff rose to 7000. The store contains 32 acres of selling space – equal to one million square feet. The Harrods motto is “Omnia Omnibus Ubique”, meaning “All Things to All People”. The aim of the store was to provide everything a shopper could want. Even today the store has 330 departments and shoppers can get everything from the latest fashions to toys and even Krispy Kreme donuts. The store has its own water wells and power station. At night the outside is lit by 11000 – 12000 light bulbs. Before the advent of led lights up to 300 light bulbs needed replacing every day! In 1898 Harrods installed the first-ever escalator in a store in England. Those who travelled on it were offered smelling salts or a stiff drink afterwards! Harrods has a maze of underground tunnels and storage rooms which go down to a depth of seven storeys! The tunnels have names like Bakers Row, Wine Cellar Way or Cheese Avenue and they lead to various cold storage areas or cellars. They once operated the old system of sending customers’ cash payments in containers along tubes to the central cashiers who would then return the correct amount of change needed for each customer in the same way. There were 39 miles of tubes used for this! There was once a Lending Library in the store. Borrowers paid an annual subscription to take out books. The Queen Mother was a regular borrower and even when the Library finally closed a parcel of books was still sent to her each month. When decimal coinage was introduced several store assistants were positioned on each floor of the shop wearing blue sashes. They were called “Decimal Pennies” and were there to assist customers in case of confusion with the new currency. During the 60’s and 70’s there were a number of bomb scares as Harrods was targeted by the IRA, and it had to be evacuated several times. In December 1974 a bomb DID go off in the House & Garden Tools Department. There was a warning so the department itself could be completely sealed off to minimise damage. January Sales were very popular with prospective buyers camping outside the store ready to be the first in on Sale Day to get the bargains. Takings during the month of January could exceed £100 million! As part of their gift-wrapping service, Harrods once used over 600 metres of paper to gift wrap a helicopter for a Harrods customer as a gift to take his partner on a trip of a lifetime. It took 150 rolls of sellotape! There used to be a famous Pets Department at Harrods, and it was said you could buy ANY pet here! Unusual or exotic pets included a lion cub known as “Christian” who was bought by two Australian back-packers. When it grew too large for their London flat, conservationist Bill Travers managed to get the lion returned to the wild in Africa. Other pets included a Honey Bear, an armadillo, a tiger cub – and even an elephant which was given to Ronald Reagan in 1976. Animals have long had an association with the store. Playwright Noel Coward once bought a pet alligator there for Christmas. Another time, a cobra was used to guard a pair of sandals worth £62,000 due to the diamonds and sapphires embedded in them. The store also had a zoo in 1917 that started off with chickens and goats and later added exotic animals. Fictional animals also have a great history with Harrods, as author A.A. Milne bought a teddy bear there for his son Christopher Robin, a bear that became famous as Winnie the Pooh! Celebrities, politicians and famous people from all walks of life have visited the store, including members of the Royal Family. One or two well-known stars – Pierce Brosnan (of James Bond fame) and David Prowse (the man in the Darth Vader suit in Star Wars) to name but two, have actually worked in the store. These two were employed on the chemist’s counter! Priscilla Presley was a regular visitor and visited the Linen Department to promote her own range of bed linens. To avoid the crowds she entered the shop through the underground tunnels! When Al Fayed bought the store he spent millions on overhauling and updating it, including installing a huge Ancient Egyptian-style escalator. After this Harrods attracted many Arab customers, including an Arab Princess. In 2010 Al Fayed severed his connection with Harrods when he sold it to Qatar Holdings. Somehow it marked the end of an era. I hope you have enjoyed reading these fascinating facts about Harrods! 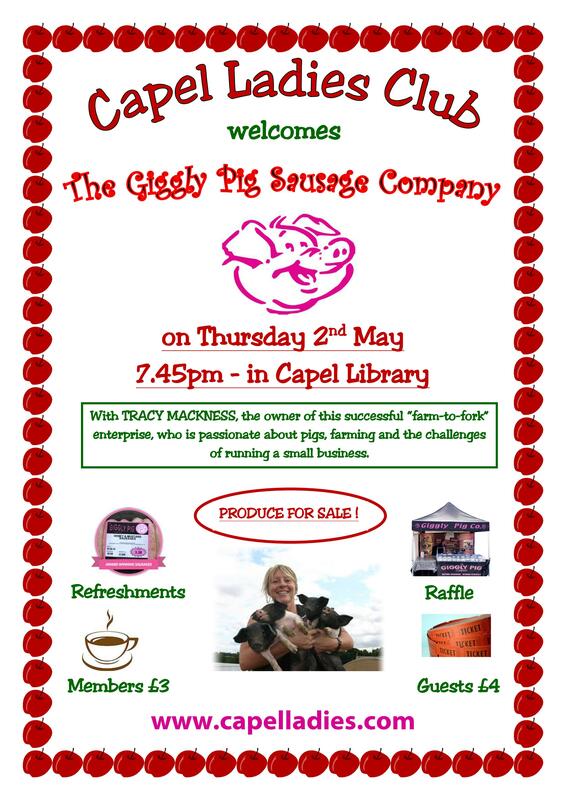 When our speaker Sue Smart gave us that very interesting talk I wanted to make a note of many of the things she told us, and as it was all too much for Capel Capers I thought I would include them in our website pages!